Both lathe models have a ground cast iron bed and cast headstock, banjo and tailstock. The KM1400 SE model is sold without legs for bench mounting but cast legs are available as an optional extra. The KM1500 SE, on the other hand, has integral legs. 12. Retaining screw to prevent the tailstock sliding off the end of the bed. 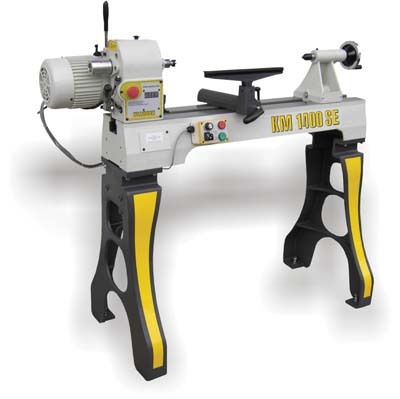 The headstock on the KM1500 SE model can be positioned anywhere along the bed of the lathe, which is especially suitable for outboard turning. The outboard turning adaptor for the KM1400 SE model, on the other hand, attaches to the end of the bed. My initial impressions of both models was that they appeared very well made; the ground beds were evidence of the build quality. I found the substantial camlock levers on both lathes to move freely whilst holding firmly, and the tailstock handwheels moved the quill freely and with ease. A 450mm (17 3/4in) bed extension, copying attachment, centre steady and a ball turning attachment are available as optional extras for either model. Before putting a piece of wood on the lathe, I tried out all the features, levers and controls. The 36-point indexing system uses a threaded pin in conjunction with a viewing hole in the outboard end of the headstock. This could be a little fiddly but on the plus side, most lathes only offer a 24-point index so this model would allow a bit more flexibility for those that need it. The spindle lock and locking pin on the inboard end of the spindle also provides a 12-point index from the front of the headstock, albeit without the tapered pin so there is a very small amount of play in this, but not enough to be significant for most purposes. The headstock has a locating pin which could be used to accurately realign the headstock when it is rotated. 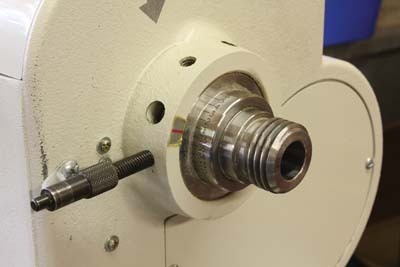 The alignment pin also has provision for adjustment to be made on initial setup of the lathe. The alignment pin is also threaded and tapered - you screw in until the tapered pin is fully located in the hole - so any backlash is easily eliminated, thus giving consistent alignment. Once set, the alignment can be reproduced with ease using this arrangement. no matter what is being turned. The magnetic remote unit held firm wherever it was placed. 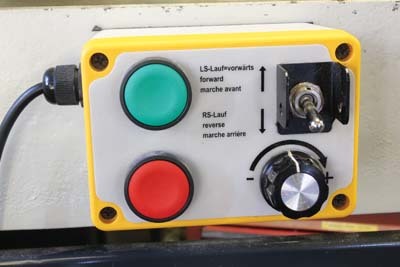 The coiled lead connecting it allowed it to be positioned anywhere on the lathe without the cable trailing on the floor; this will avoid the likelihood of potential tripping hazards for the operator and should also keep it clear of the pile of shavings under the lathe. I used the controls to drive the lathe through the whole speed range. 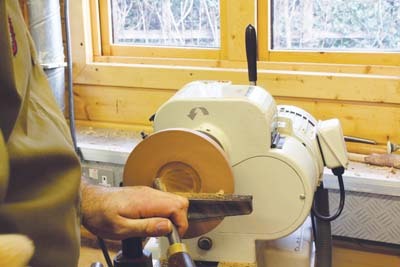 Although the ranges are stated as starting at zero, in practice the lowest running speed seems to be around 150rpm, which in reality, is more than slow enough for a lathe of this size. My first turning test was with the KM1400 SE model. To put the bearings through their paces I thought a goblet would be a reasonable test as it would entail a significant overhang, given the length of the blank combined with the width of the chuck. Cutting across the end of the spindle left a clean surface and under end grain hollowing, there was no sign of vibration through the spindle. 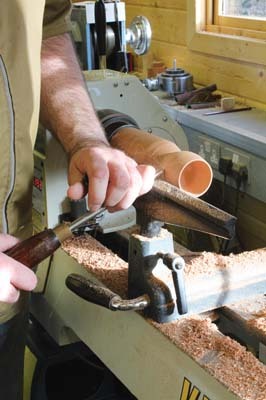 Turning the outside and stem, the stability of the lathe helped when turning the stem down to a few millimetres in diameter. 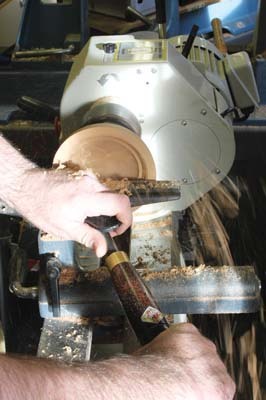 My second test on the KM1400 was to turn a bowl. The blank I chose had a flaw on one side that I wanted to remove without wasting too much wood so I mounted the blank about 25mm (1in) offcentre. The offcentre blank was going to cause balancing issues so I started the lathe at the lowest speed and increased it until vibrations were evident. Doing this, I was able to start turning at around 650rpm. As I removed the offcentre mass from the blank, I was able to progressively increase the speed and once balanced, I turned at around 1,500rpm. no matter how hard I tried. If more torque was needed the lower speed range would be the better choice but I didn't find it necessary to switch. With all the turning, one thing I noticed was how quiet the lathe was in use. There was no whine or vibration from the motor and spindle assembly so it was a pleasant experience. I will concentrate on the functional differences here. 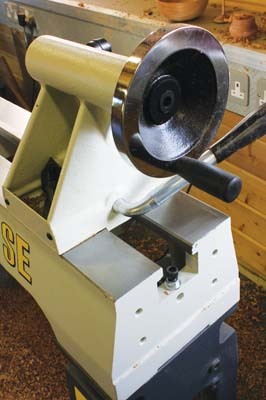 The KM1500 SE has box section legs which are included with the lathe. The leg at the headstock end contains the electronics. The base of each leg has a flat plate for a foot which extends the footprint and should increase the stability. 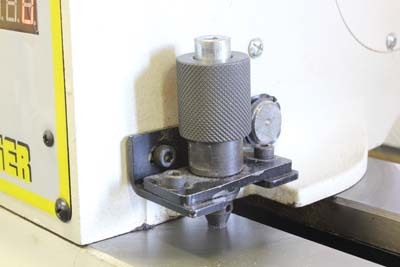 The 36-point indexing system uses a 12-point index on the inboard end of the spindle and a tapered, threaded pin which is inserted into one of three holes to achieve the 36 points. The holes for the pin are quite close to the headstock so with my big fingers, it was a bit fiddly to screw the pin into the hole. I can also envisage the threads in the holes becoming filled with wood dust, making the threads stiff to operate so it would be advisable to keep the threads clean to prevent this from happening. 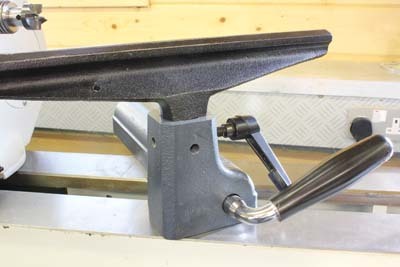 The headstock could be rotated and slid anywhere along the bed for use with the outboard turning attachment. The alignment mechanism seemed less precise than on the smaller lathe so it might be necessary to use a manual alignment method. There is also a shelf beneath the bed which could be used to store tools, wood, etc. I noticed the leg at the tailstock end was hollow so it could be filled with ballast to further increase the mass of the lathe, if the user finds this necessary. I turned a goblet as I did for the smaller model and the lathe performed admirably. There was no sign of bearing-related vibration due to the long overhang. As a second test, I turned a bowl and again tried to take some big cuts to slow the lathe down, but it took it all in its stride. Both models appeared well made and robust. I liked the attention to detail with features such as the interlock on the pulley belt cover and the additional emergency stop button prominently sited on the headstock. The maximum turning diameter was ample for most turnerâ€™s needs and the outboard attachment offers more for those that need it. 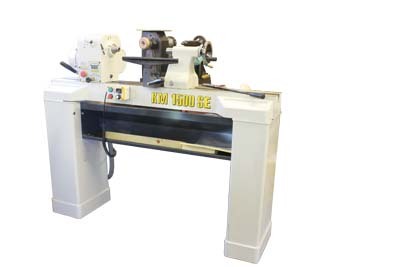 The range of optional extras for these lathes would also benefit those needing more than a standard lathe could offer.